Food additives have been used for thousands of years, ever since people realized salt could keep meat from spoiling. Today, there are more than 10,000 additives approved by the U.S. Food and Drug Administration (FDA) to preserve, package, or modify the taste, look, texture, or nutrients in foods. But increasing evidence suggests some chemicals used as food additives should be avoided―especially for children. The American Academy of Pediatrics (AAP) policy, "Food Additives and Child Health," explains that a rising number of studies suggest some food additives may interfere with hormones, growth, and development Some may also raise a child's risk of obesity. Children may be particularly susceptible to the effects of these additives, given that they have more exposure than adults due to their size and dietary intake. Below is a list of the most commonly used food additives and the current health concerns. This list includes indirect additives, which are used in processing or packaging, as well as direct additives that are put directly into foods. Buy fresh or frozen. It's best to buy and serve fresh or frozen fruits and vegetables when possible. Eat fewer processed meats. Try to avoid processed meats, such as hot dogs, ham and meats in pre-packaged meals, especially during pregnancy. Wash plastic food containers and utensils by hand, rather than in the dishwasher. Heat can cause plastics to leak BPA and phthalates into food. Avoid microwaving food or beverages―including infant formula and breastmilk―in plastic, if possible. Use glass and stainless steel. Especially when cooking or serving hot foods, use alternatives to plastic, such as glass or stainless steel, when possible. Learn plastic recycling codes. Look at the recycling code on the bottom of products to find the plastic type. Try to avoid plastics with recycling codes 3 (phthalates), 6 (styrene), and 7 (bisphenols) unless plastics are labeled as "biobased" or "greenware," which means they are made from corn and do not contain bisphenols. Wash your hands. Because chemicals from plastics are so common in items we touch throughout the day, be sure to wash your hands thoroughly before and after handling food. Speak out. Join the AAP and other organizations calling for more research into food additives' safety, including improvements to the U.S. food additive regulatory program and retesting some previously approved additives. A recent review of nearly 4,000 food additives showed that 64% of them had had no research showing they were safe for people to eat or drink. While some change to the current law could be achieved by the FDA, some may require congressional action. How do I find out which additives are in foods? Additives that are put directly in foods are listed on ingredient labels, but often with their chemical names. For example, salt may be listed as sodium chloride, sugar as sucrose, vitamin C as ascorbic acid, and vitamin E as alpha-tocopherol. Artificial colors are usually listed by their numbers, such as Blue #2 or Yellow #5. However, there are also indirect additives from processing or packaging materials that are not listed on the ingredient labels. These can include chemicals from plastic, glues, dyes, paper, cardboard, and different types of coatings. Are additives a problem in any baby products? The FDA recently banned BPA from baby bottles and sippy cups, but the chemical is still used in some food and beverage containers. Many companies have voluntarily removed BPA from their products, but in many cases replaced it with chemicals such as bisphenol S (BPS) that may have similar health effects. In 2017, the Consumer Product Safety Commission banned the use of some phthalates in child-care products such as teething rings. Do artificial food colors cause childhood hyperactivity? More research is needed to better understand how artificial food colors (AFCs) may or may not impact a child's behavior. This is because much of the original research on these additives were animal studies that did not include behavioral affects. For some children with attention-deficit/hyperactivity disorder (ADHD) and other problem behaviors, the AAP says that until we know more, it may be helpful to eliminate AFCs from their diet if they seem to worsen symptoms. Many new techniques are being researched that will improve how additives are produced. One approach is the use of biotechnology, which can use simple organisms to produce food additives. These additives are the same as food components found in nature. 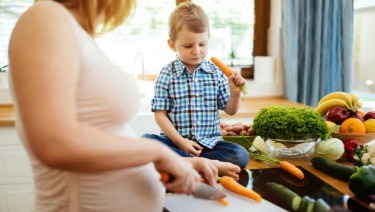 Although there are ways to limit the amount of potentially harmful food additives in your family's diet, stronger federal food safety requirements will help keep all children healthy.